Although the weather should be getting a little warmer now, we are still at risk from frosts and maybe even snow. Therefore you should continue to protect vulnerable plants by wrapping them with garden fleece. Pots and containers should be protected using a layer of garden fleece or bubble wrap around the container, and where practical they should be raised off the ground. Delicate shrubs and immature trees will benefit from a good layer of dry mulch to protect their roots. When the weather permits you should continue to dig over your beds and borders, adding organic matter as you go. This will not only prepare the ground for the spring but also expose garden pests to the hungry birds. This is an important time for pruning to encourage vigorous and healthy growth for the future. Late summer and autumn flowering clematis should be cut back to about 30cm, this may seem harsh but they will soon grow back and will produce flowers in abundance. Hardy evergreens and wisteria should be cut back; all shoots coming from the main branches should be pruned to leave just 2-3 buds, this will encourage the growth of more flowering spurs. Roses should be pruned by cutting out all dead and weak stems. Hybrid tea roses should be cut down to about 20cm to an outward facing bud while floribundas should be cut to about 25-30cm. 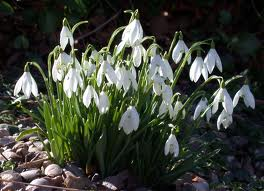 Plant container grown snowdrops, add some fertiliser and a sprinkling of bonemeal, plant them slightly deeper than they were in the pot. Pansies and heathers can help to bring some colour to the garden. Try planting pansies in groups to give a greater impact. Now is also a good time to clean, repair and service your garden tools and mower in preparation for the months ahead.